This is the fourth in a series of posts about how different demographic groups in the U.S. have fared in the digital age. 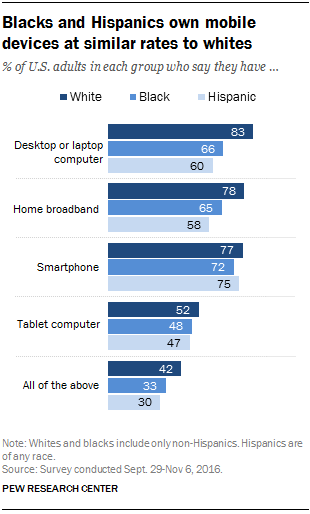 But despite these inequalities, blacks and Hispanics have mobile devices such as smartphones and tablet computers in shares similar to whites. There are differences between Hispanics born inside and outside the U.S.: 88% of native-born Hispanics own a smartphone, compared with 62% of Hispanics born abroad. About three-quarters of whites and blacks own a smartphone. Mobile devices play an outsize role for blacks and Hispanics when it comes to their online access options. About two-in-ten Hispanics (22%) and 15% of blacks are “smartphone only” internet users – meaning they lack traditional home broadband service but do own a smartphone. By comparison, 9% of whites fall into this category. In addition, blacks and Hispanics are also more likely than whites to rely on their smartphones for a number of activities, such as looking up health information or looking for work. Although smartphones help bridge the gaps in internet access, other Pew Research Center data show that blacks, Hispanics and lower-income smartphone users are about twice as likely as whites to have canceled or cut off service because of the expense. As is true of the population more broadly, smartphones play an especially prominent role in providing online access to blacks and Hispanics with relatively low household incomes. Only around half of blacks and Hispanics from households earning less than $30,000 per year have traditional broadband service at home. But 63% of blacks and 69% of Hispanics in this income bracket are smartphone owners. Smartphones are not the only way those without traditional access options attempt to bridge these gaps. For blacks in particular, libraries can play an important role: 42% of black library users say they use libraries’ computers and internet connections, compared with one-quarter of whites and 24% of Hispanics, according to Center data. And blacks and Hispanics alike express pronounced interest in getting training that would help improve their digital skills. Some 46% of blacks and 48% of Hispanics say training to help them be more confident in using computers, smartphones, and the internet would help “a lot” in terms of making important decisions, compared with 20% of whites. Lower home broadband adoption rates among blacks and Hispanics may be a result of multiple factors. For example, foreign-born or Spanish-language-dominant Hispanics are far less likely to report having high-speed internet at home. And given that blacks and Hispanics on average have lower household incomes than whites, cost may also play a role: A majority of U.S. adults cited monthly cost of home broadband subscriptions as a reason for not subscribing. Others cite credit scores that are often required by broadband companies as a factor.